exponentially. 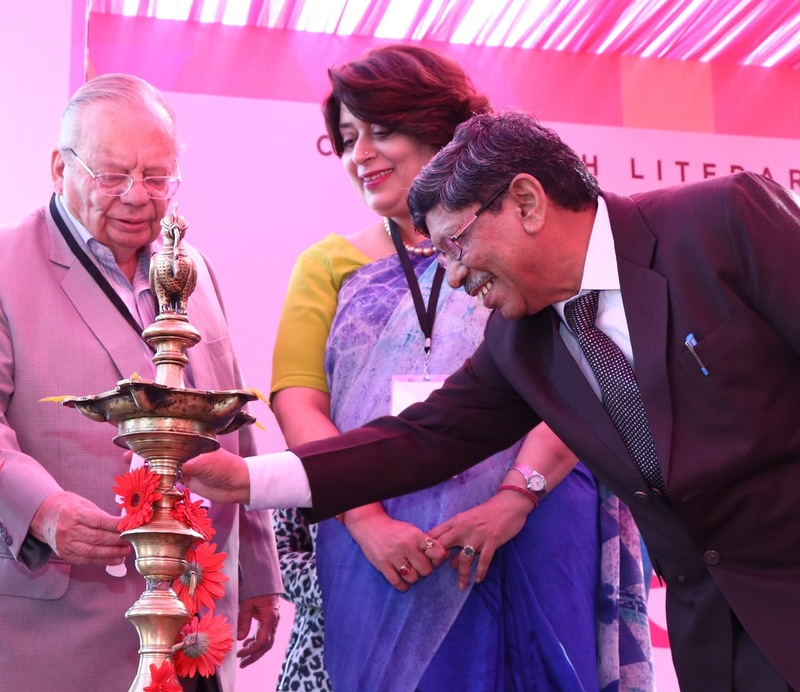 Ever since its debut in 2013, Literatihas been one of the most sought-after events on the Indian literary landscape. Some of the noted authors we have had the pleasure of hosting authors like Ruskin Bond, Amish Tripathi, Ashwin Sanghi, Jerry Pinto, Kishwar Desai, Ashok Vajpeyi, Navtej Sarna, Tarek Fatah, Nandita Puri, Pushpesh Pant, Rahul Pandita, Shefalee Vasudeva, Surjit Patar, Rujuta Divekar, Krishna Devulapali, Kamla Kapur, Kiran Nagarkar, Mridula Koshy, Madhulika Liddle, Tavleen Singh, Sumita Misra, Leila Seth, Ram Verma, Hugh and Coleen Gantzer, Gulzar Sandhu, Khushwant Singh and so on. 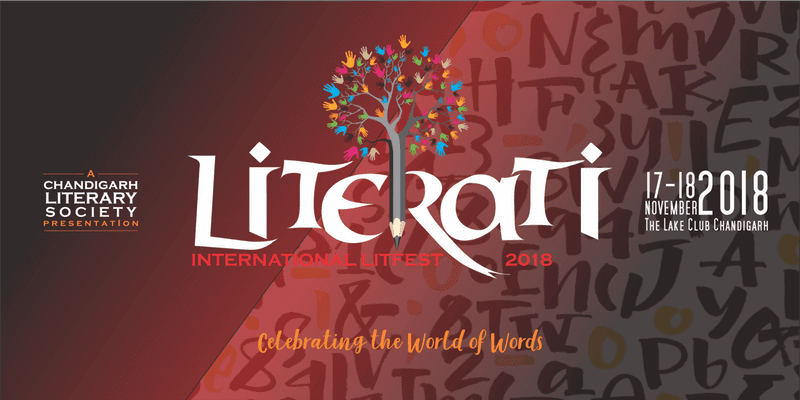 Other than this, Literati has also seen the active participation of foreign writers like Columpa Bobb, Lee Maracle, Shauna Singh Baldwin in collaboration with the Canadian High Commission. All our events have been extensively covered by both print and electronic media. The Entry is Free, but Registration is mandatory. Chandigarh Literary Society (CLS) had organized an online short story writing competition in May, and after an overwhelming response and review by a panel of judges, six top entries were selected. 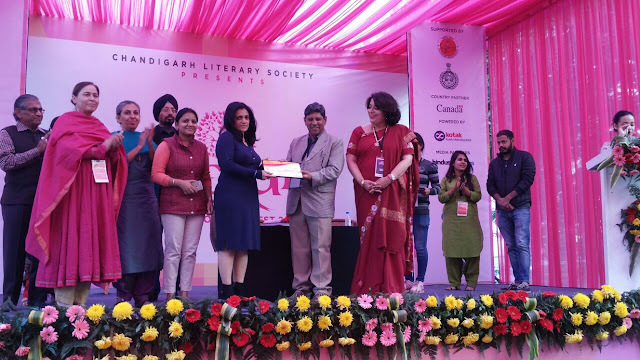 Ms Deep K Samlok’s ‘Biji ke gadde’ was adjudged as the best story followed by Rashmi Sharma and Dr Devlyani Singh’s stories which came 2nd and 3rdrespectively. The next three stories in 4th to 6th position are Chanakya Grover’s “Anonymity is my power’, Dr. Aditya Rattan’s “The fall of the pride”, and Radhika Singh’s “Intertwined”. All the winners were given the prizes at the concluding function of the 5th Chandigarh Lit Fest, Literati by Chandigarh Literary Society. "I would love to write biography of Vijay Malaya and Parkash Singh Badal", says Khushwant. 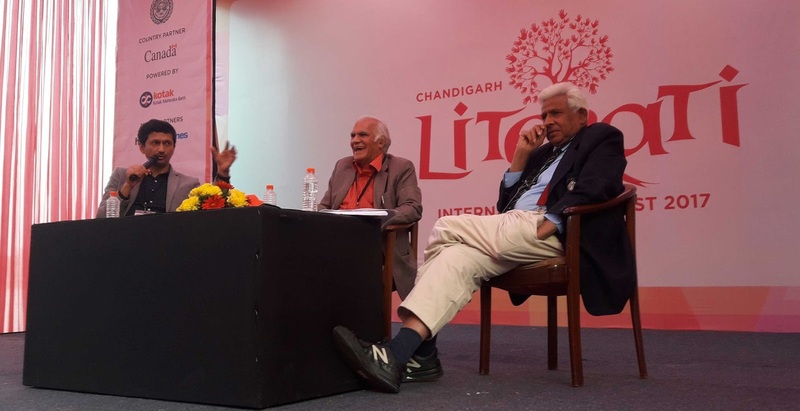 Biographer of Chief Minister of Punjab, Capt Amarinder Singh, Khushwant Singh responded to questions from the moderator Neel Kamal Puri and the audience who wanted to know more about various incidents and challenges that he faced as a biographer. People were calling me up and commenting on social media to desist from writing biography on Capt Amarinder Singh, who had lost elections in 2012. Yet I went ahead because my subject never interfered with my research or narrative except for correcting facts or dates, and this became a wonderful experience, Khushwant added. The tipping point in researching him was the journal of governess, a German lady, who had made copious notes about prince's day to day life, which he stumbled upon that made writing about his childhood very gripping and interesting. There were numerous interviews, and even the letters his Doon School principal wrote to Captain's mother that completed the narrative of his childhood days. The biography was released just before the results of his elections this year, and would update in the next edition after his current tenure only on which I'm working, he said. Biographies unveil the most significant part of history and I would definitely like to write about Vijay Malaya or Parkash Singh Badal if given an opportunity, he added. Preserve the Mother Earth, say Canadian authors. Chandigarh, November 26: The highlight of last day's discussions was the presence of two authors, activists, poets, playwrights, Lee Maracle and Columpa Bobb, who took the discussions in the session "Roots and Wings" moderated by Canada's Consul General Dr Christopher Gibbins, to an entirely new level with their simplicity, raw humour and stories of original settlers, the Red Indians, now called 'indigenous' people. 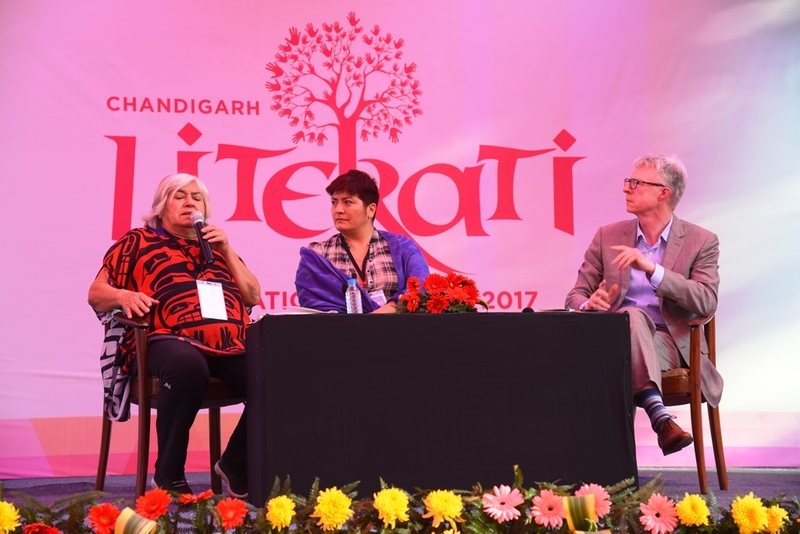 Lee Maracle who is an award winning author and activist for indigenous people in Canada, and Centre for Indigenous Theatre in Canada, emphasised to be in consort with Nature, develop collective wisdom and collaborate to bring about the change in the society. In order to preserve Nature and be in harmony with Nature, the younger generation must develop the fine collective wisdom of jelly fish which does not have a single brain cell yet can communicate and collaborate with fellow jelly fish and hunt together, Lee said. Columpa Bobb, another award winning acclaimed author of several books including autobiography, poetry, and fiction, beautifully related the story of "I am Changing Me" to accept change as an unchanging constant reality and evolve with change. Each childhood story has a lesson to tell, and lifts your spirits and pulls you out of dark situations or saddness, Columpa remarked. The entire conversation revolved around the beauty of Nature and respect for mother earth which would continue to punish mankind with hurricanes and storms if we forget about it, said both the authors. On the second day of the Chandigarh Literary Society's, Rujuta Diwekar was the star in the forenoon sessions, with lively floor participation to know more about what to eat and what not to eat. Rujuta is a winner of Nutrition Award from Asian Institute of Gastroenterology, and amonst the most qualified and sought]-after sports science and nutrition expert with five best selling books on nutrition and exercise. She debunked the myth about eating desi ghee, curd, milk products, achaar, kadhi chawal, rajma chawal, etc, since these are the common household products which won't sell in the commercial-oriented market, and that is the reason organic and exotic foods get promoted on the pretext of health. Eat well and follow the advice of the home makers and not the dieticians or the doctors, she remarked. She advised the alcohol intake should be moderated and taken after meals and not before that which damages the body. Whole lot of research has shown, that poor diet, lack of exercise, leads to diabetes, heart attack, and alcohol should be in moderate… after your dinner and than drink, and not the other way round, which makes it bad. Having counselled celebrities like Kareena Kapoor, Anil Ambani, Alia Bhatt, Varun Dhawan, Saif Ali Khan, Anupam Kher, Karishma Kapoor, Shahid Kapoor, she has been voted as 50 most powerful people in India by the 'People' magazine. She is among only 3 Indians in CNN Asia Hotest People to Watch Out for. Earlier Panjabi literateur Atamjeet Singh, Manmohan Singh and Jasbeer Mand talked about the Panjabi literature in the session "Watan De Wark" moderated by Ravee Pandher. Chandigarh, Nov 25: Former senior civil servant of Haryana, Ram S Varma’s autobiographical political memoir, “My Encounters with the Three Lal’s of Haryana” was released here today at Literati. In one of the afternoon sessions on “Sarkari Sagas: Civil and Uncivil” which saw Ram S Varma, with another retired civil servant and author Robin Gupta with Vivek Atray, another civil servant who recently resigned from Haryana government to pursue his creative dreams, the varied aspects of bureaucracy and working in the government were unveiled. Published by Rupa, the book is about Ram Varma’s journey with the three powerful chief ministers of Haryana over his three decades of chequered career that saw many ups and downs. “I owe my literary journey to Ch Bhajan Lal, erstwhile chief minister of Haryana, who posted me to non-descript post with no work as an OSD as punishment for not issuing national permit to his favourite transporters, leaving me with plenty of time to write middles for a local daily,” he said. Ram Varma was all praise for the three chief ministers of Haryana who transformed the state from a improvished one into an economically flourishing one. Robin Gupta, in his “Memoirs of an unrepentant civil servant” is more critical of the political interferences and critical degradation of the services and described his memoirs as a “sad book” for his inability to bring about the changes and reforms that he wanted to prevent bureaucracy from becoming political robots. Prolific writer and author of famous nove, “Teenage Diaries” Saurabh Sharma, much-acclaimed poetess and author of “First Fire” Archana Sahni, and young entrepreneur with author of number of books with latest being “Harappa” Vineet Bajpai explored the nuances of poetry and prose with Saguna Jain. Author of “Mr and Mrs Jinnah”Sheela Reddy and famous critic and historian, and an activist popularizing Hindi and Urdu literature, Rakshanda Jalil, explored with Suparna-Saraswati Puri the connect between the politics, literature, and culture. The first day ended with the session on “Here and Now” that focused on how the empowered women of the city, Dr Sumita Misra, Neel Kamal Puri, Vandhana Shukla with Chetna Keer talked about the young women writers. 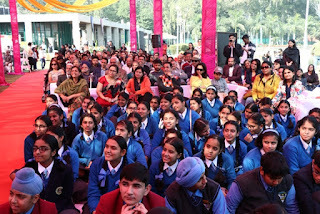 Neel Kamal Puri said that women writers are more liberated today with good equation and understanding of other gender, while Dr Sumita Misra emphasized the need for self-belief and confidence which has an empowering effect on young writers. Vandana Shukla asked the young writers on clarity of their thoughts as to what they want out of life. 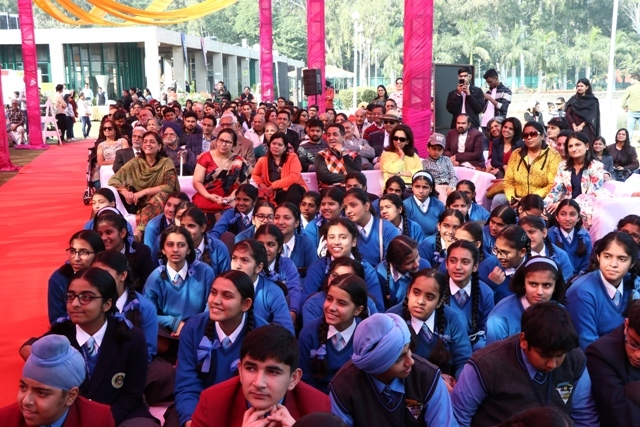 ChChandigarh, 25 November : Hundreds of children from different local schools thronged the sylvan surroundings of Sukhna Lake which formed the backdrop to the 5th edition of the international lit fest, Literati 2017. 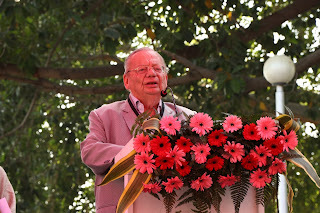 With the Lake Club venue choc-o-block with avid readers and fans of Padamshree Ruskin Bond, the children and the parents alike quizzed the author about his different novels and short stories. Addressing the children his only advice was that since parents are taking care of you and make you study in good schools, just take care of them when you grow up. Chandigarh Literary Society conferred on Ruskin Bond its first Lifetime Achievement Award, which comprised of citation and a humble gift of Rs. 2 lakh. Though born and brought up in India, he was sent back to London in 50s after his schooling, where he worked as well as wrote his first novel at 17, “Room on the Roof” but as soon as he got the advance of 50 pounds from the publisher he took the ticket back to India in 1955; “I could not live anywhere else in the world than India, which brought me back here.” Ruskin Bond remarked. “I identify myself with a lone fox which I saw once in Mussoorie hills in a moonlit night, which inspired me to title my autobiography ‘Lone Fox Dancing’,” he remarked. “It is all truthful and no fiction, which I might invent in the sequel to this autobiography,” he remarked jocularly. Sharing the tips for writing in response to a question by a youngster, he said that a writer must respect the language and grammar, write regularly, find a space for solitude in the room or home, read literature, and adopt simple style so that readers can relate to it and enjoy it. Responding to another question from a student as to whether one could make a career in writing, he said that he writes for the joy of it and he has never looked for fame or fortune. What would you be had you not been a writer? “I would have either been a sumo wrestler or a football player”, he said laughingly. He related anecdotes of being mistaken by someone else on lots of occasions, at party, at the airports, and social gatherings, and even associating him with different work of literature by some other authors. “People can relate to my stories because it is all about people who are real in their character and emotions, but when I run out of the people to write about, I chose animals, and if I run out of animals, I write about ghosts”, Ruskin Bond said. He implored the budding writers to work for the protection of the environment and to set limit to the urbanization, so that we can preserve it for posterity. 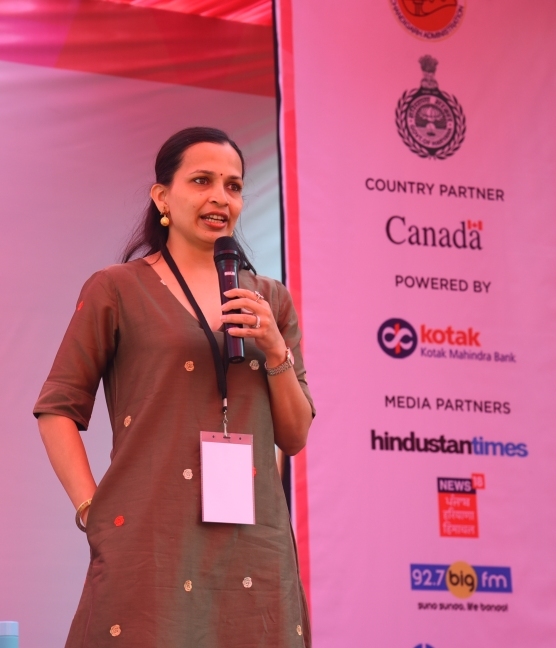 Earlier Dr Sumita Misra, Chairperson of CLS, in her welcome remarks said Literati has gone international with the joining of Canada as the partner country, whose two prominent authors will be featured on Sunday. Dr Christopher Gibbins, Consul General of Canada was present at the venue throughout the day. 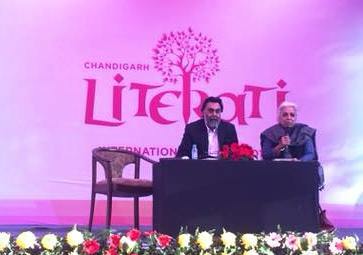 Madhav Kaushik, Vice Chair of CLS said that Literati is the celebration of the divinity and dignity of the written world. Chandigarh Literary Society 2012. Watermark theme. Powered by Blogger.